I have seen more then one oddball Javelin with that bubble hood or flares and other "Kaplan" stuff. He had to sell that stuff for AMC dealers when people came in and ordered it. Maybe he just had his fiberglass guy send it direct. But the rear deck lid spoilers could be ordered and I have seen one bubble hoop scoop in a brown Rambler bag with a part number on it. So you could probably order that bubble hood too. Just like the steel 290 rods that AMC never made yet I had 15 NOS ones in brown Rambler bags at one point. They had to put part numbers on all of that stuff and then actually sell it if someone ordered it. So I am guessing in 1969 if you wanted to run a Javelin in road racing events and went to the dealer for parts they pointed you to Kaplans race shop. Its been a few years since I talked to John Martin but he told me they did work on customer stuff to keep the lights on since AMC was so stingy. I also dont think each of the oddball Javelins were built from the ground up by Kaplans shop. This car..... http://www.cardomain.com/ride/3177576/1969-amc-javelin/ was a base Javelin that was shipped to Australia with a container full of race parts from Kaplans shop. 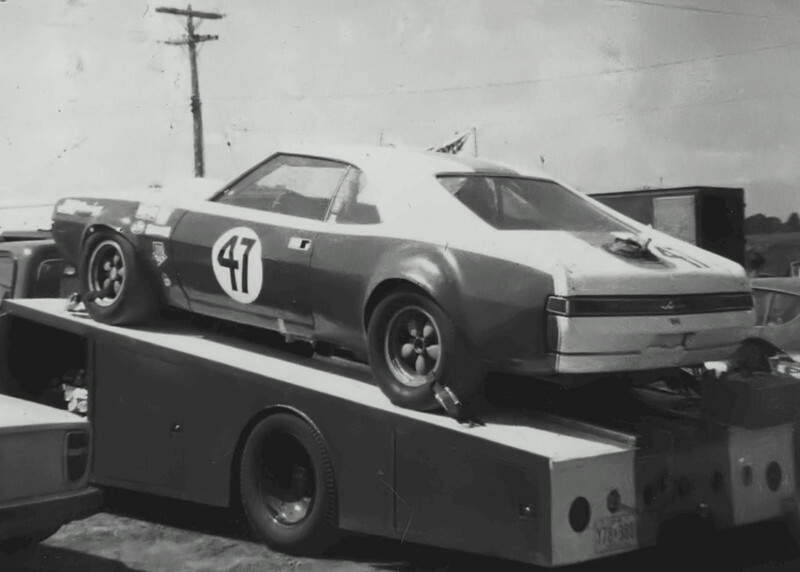 For years people thought Kaplan built this car and shipped to Australia but in reality the parts were sent with a factory passenger car that was built in Australia with the parts in the container. Oddball Javelins with "Kaplan" parts. I see where this Dewar car still has the daisy wheels and the #4 RKE Javelin has minilites. That Dewar car also has a hood pin in the middle of the hood which the RKE Javelins did not. Although the 1969 NASCAR GT Javelin did have a middle hood pin. Let me outline my intent, to further knowledge and study, wherever that search leads. I greatly appreciate your joining the discussion, Adam. Interesting Javelins.There are more articles on the one with the Kaplan hood and stock looking fenders and rear quarters. The 21 car has a more extensive background, which I may revisit later. Regarding the G D #47, the wheels are what helped differentiate this car from the #4 car. Thank you. The flares are subtley different as well with flat lip extensions that are very noticeable compared to the 4 car and very close to the #3 car - http://www.camaros.org/forum/index.php?topic=8328.0 - color action pic near bottom of pg. 1. The holes I drew attention to earlier on the #47 decklid and end caps are identical in placement and purpose to the nmbr(s) 3 and 4. They secure the decklid. http://www.camaros.org/forum/index.php?topic=8328.75 - b & w #3 car in pits being pushed excellent shot of decklid pin, lanyard, and attachment through rear quarter panel end cap. http://www.camaros.org/forum/index.php?topic=9860.0 pg 1 very first article mentions what American Motors will be doing for the upcoming '69 season. It discusses two team cars and two cars held in reserve. That is an interesting point. The Dewar car bears closer attention. Not necessarily as a potential reserve team car, though it is fascinating that Dewar comes down from Canada to provide just such a reserve function for the Watkins Glen race later in the year. The details of the car that jump out, to me, removes this car from oddball status to important customer car that contains all the "A" team markers- 3 pin fiberglass "huge" hood, wheel lips that closely match # 3's, the signature rear deckled security, no rear spoiler, quick fill fuel cell system through the deckled, and very similar front bumper license plate indent cover with the fastener holes in very similar locations. Makes one wonder, as money got tight, what happened to at least one reserve car…I think we can agree that the Dewar car appears to be a definite candidate as a Kaplan customer car. It appears also that in order, aside from finding Gordon Dewar himself, to find out more about the Dewar car that motorsport photos will be the means for seeing what configuration his 47 Javelin sported in Canada. Would Mr. Kaplan remember anything about the Dewar's car's origins? "Gordon Dewar from Ontario always had very nice cars. Here, he’s driving his Trans-Am Camaro in 1970. He had previously owned a factory Javelin that he had bought from Ronnie Kaplan." I am a Canadian motorsport history writer looking to document some of the Canadian pony cars- Gord Dewar ran the third Javelin at several Trans Am in the 1969 year and supposedly returned the car to AMC at year's end where it was given to Penske. Some of these Cars went to the Grand American series but I don't have a source for the results. I note that you have a fairly decent listing of the Javelins results. Is there a source online that I could use to track the Canadian cars?? According to ultmateracinghistory.com Dewar only raced one T/A race at the Glen in 69, with the Javelin - described as the Ronnie Kaplan Javelin. Gordon passed away in the mid eighties if I remember. Are you certain? I recall seeing reference to a Dewar award in 2005 in which the author mentions Gordon Dewar in recent ( to then in '05 ) times. I'm also thinking that the Canadian motorsport history writer from the Sandcastle email is referring to the other "Trans Am" appearances by Dewar when he means the Canadian series that Adam showed aresult from. It is pretty evident that the writer must be French Canadian given his English sentence structure. If so, perhaps this other Robert could be tracked down? Perhaps he hails from Montreal? In 1986 Dewar was shot in the face but wasnt fatal. Gord Dewar of Ottawa given an excellent chance of finishing well in the race and of placing high in the" standings of the million dollar, 10-event Can-Am series. Dewar, is expected to do well in the March 707 that Chris Amon drove in the lat- ter part of the 1970 series. Sponsored by Travelmate Motor Homes, Dewar will give away a bit in power, dropping to a 427 cubic inch engine from the 494 used by Amon, but DeWar's crew chief, Ronnie Kaplan of Chicago, is a recognized genius with the 427 engine. Not only is Gordon Dewar fleshing out as a colorful ( massive understatement ) personality from the various anecdotes written about him in looking into his background, and certainly not an impression diminished after reading the newspaper article above, but the increasing build-up through Adam's detective work that Dewar's car and person bears no mere happenstance or chance relationship with Ronnie Kaplan. I strongly suspect much mutual trust and respect went on between the two men for Kaplan to be retained as a crew chief on one of three March 707's ever built and a former Amon car to boot! Straight from the source.....which is Ronnie Kaplan....just got an email from him. "Yes. He bought a javelin and I later sold it for him. At this time I can’t remember to who. Well, there we have it. Thank you Adam. It would be of interest to determine which Javelin he sold him, but it is also pretty clear from all the details present on the car that it probably was very closely allied to the number 3 & 4 car in terms of modification and intended use. From Dewar could also be gleaned details, and in particular, if Canadian racing postings don't materialize, at what point in '69 he received the car.